If you think GDPR does not apply to you then think again. The GDPR (General Data Protection Regulation) is a new privacy law in Europe that is aimed to give you more control over your personal information. If you collect and process data from anyone with in the EU then you need to be in compliance. Today I am going to walk you through how to make your opt in forms compliant using Mailerlite forms. Make sure you Pin it and SAVE this post for later. Disclaimer: I am not a lawyer and this should not be taken as legal advice. I am just a blogger who is trying to figure this out just like you. The steps I describe does not take the place of legal advise and if you are concerned you should consult a lawyer for further clarification of the law and how it affects your blog and business. Are you ready to start a blog? 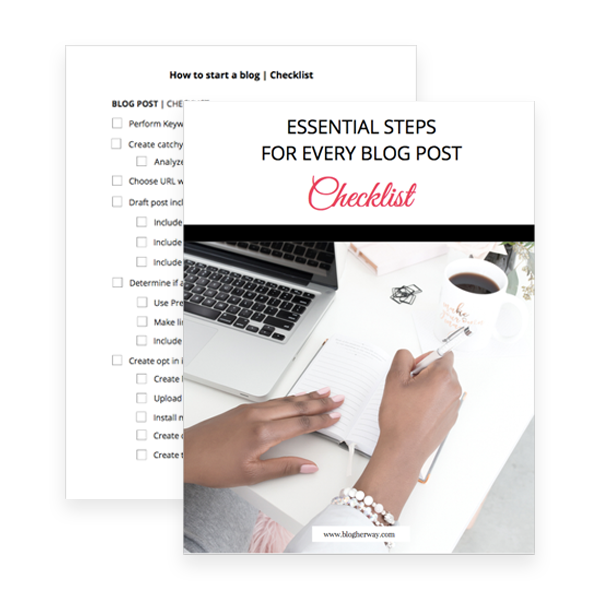 Be sure to grab my How to Start a Blog Checklist. This handy checklist has 100+ actionable steps you should take when setting up your blog. How does GDPR affect list building? When building your email list it is a good idea to offer a lead magnet or content upgrade that is an enticing freebie. 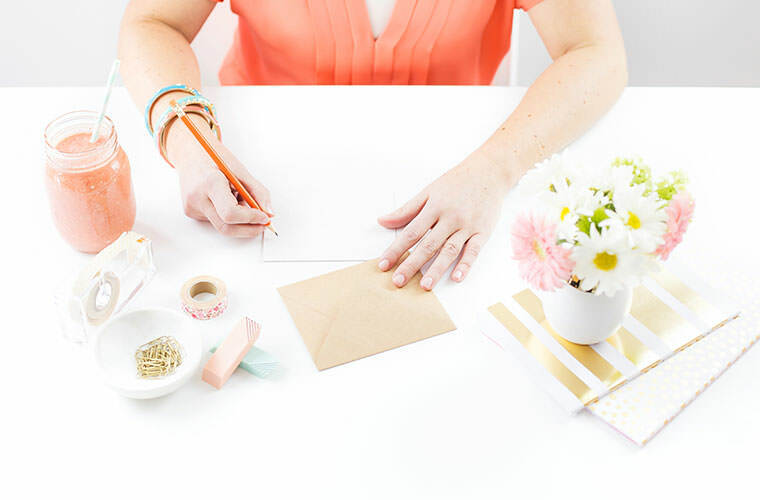 Your reader will give their email in exchange for this awesome freebie, which helps to build your email subscriber list. 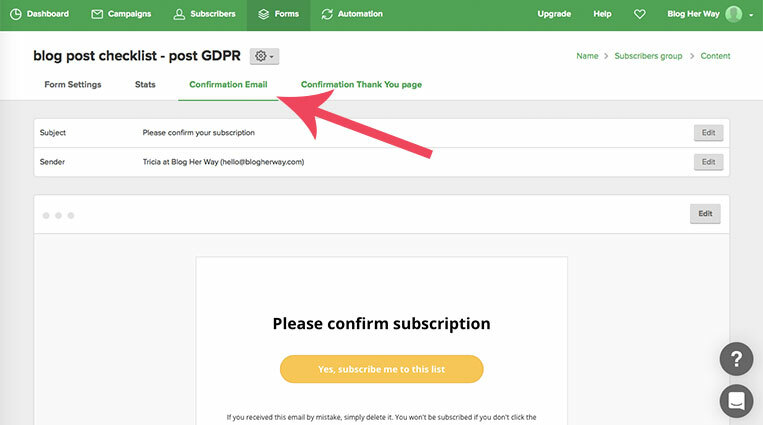 Under GDPR just becomes someone opts in to receive a freebie it does not mean that you can automatically add them to your regular promotional newsletter list. A person needs to give explicit consent to be added to this list. Also, you cannot make it a requirement to join your promotional email list to be able to receive your freebie. A person should be able to receive your freebie without having to consent to be added to your regular promotional list. If you are new to list building then definitely check out Mailerlite. I highly recommend them as a email service provider. They are free for your first 1,000 subscribers and have automation capabilities which is a must have feature when it comes to running your blog. Create an account today! 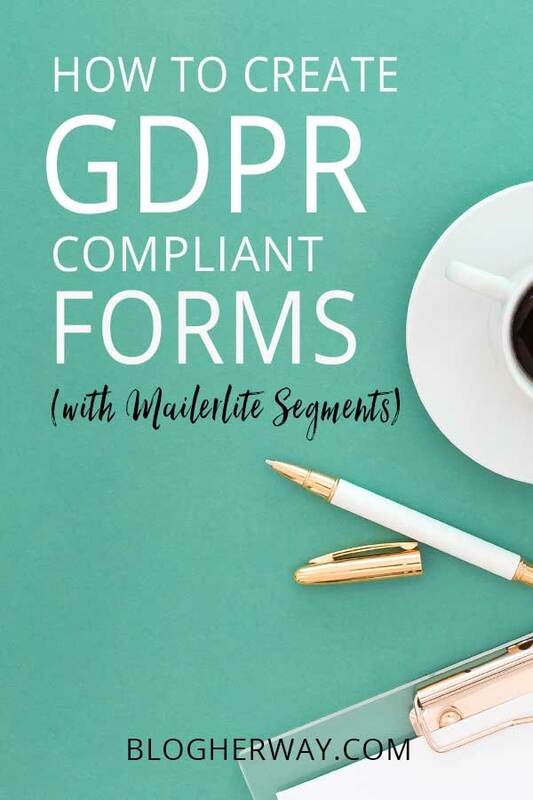 Mailerlite has updated their forms to help in your quest to become GDPR compliant with some new features including marketing permissions and hidden segments. Keep reading to learn how to use these features. *Note: You need to create a brand new form in order to access these features. You are not able to modify any existing forms. At this point you should have created your opt in freebie. Within Mailerlite you want to be able to see who has requested what opt in. In order to do this you need to create a new field unique to each individual opt in freebie. In the Mailerlite dashboard click on Subscribers from the top menu and then select Fields. Click to Add a New Field. Give your field a name and make sure Text is selected from the drop down menu. After creating your new field it will show up in your list. In the Mailerlite dashboard click on forms from the main menu and then click Create Embedded Form. 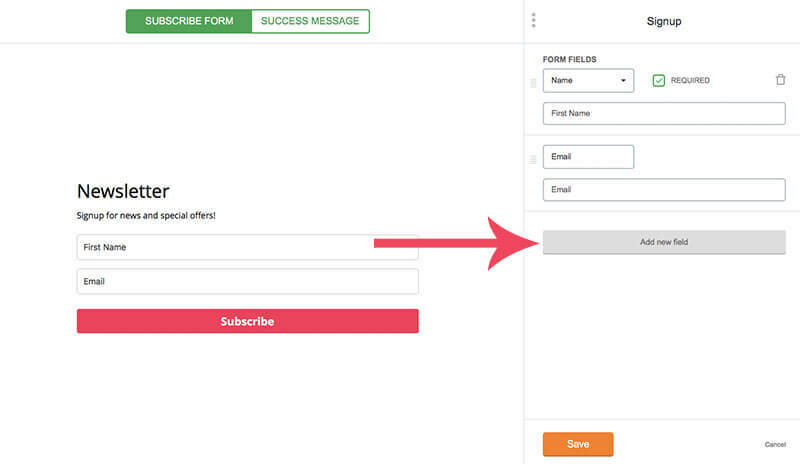 Give your form a name and then pick your subscriber group. Under the form design section specify what color you want your text, background and button color to be. By default Email is the only field that is visible. If you want to add a new field to your opt then hover over the Email field and click on the edit icon. New options will appear in the right hand menu. Click on the button to add a new field. I like to collect the First Name of my subscribers so I can personalize my emails using their name. However I do not make this a required field. 1. 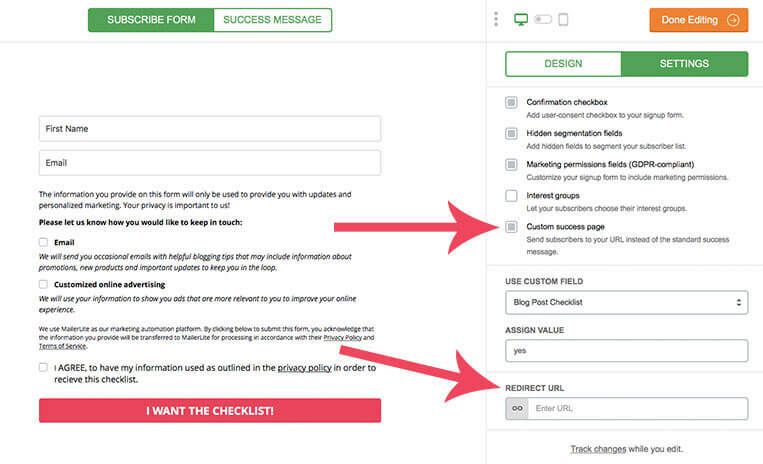 Confirmation checkbox – Add user consent checkbox to your sign up form. This checkbox will give proof that the person agreed to give you their information to then send them your opt in freebie. 2. Hidden segmentation fields – this allows you to add hidden fields to help segment your list. 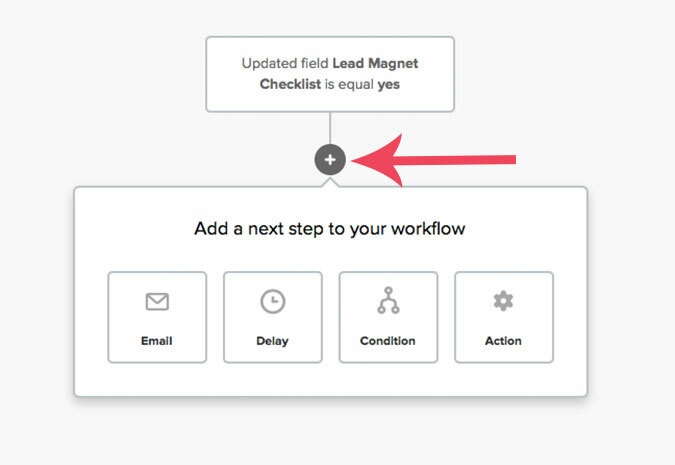 Select the new field you created in Step 1 and assign it a value of yes. Mailerlite includes two default marketing permission fields: Email and Customized online advertising. Like I said before you cannot automatically add someone to your regular email promotions list. You need to get separate consent for the person to be added to your regular email list. Also, you need to get separate consent to use their email for ad retargeting. An example would be Facebook Ads. Hover over the section to make any changes to the wording. Click on options to add or remove any of the different marketing permission types. 4. Interest groups – Let you subscribers choose their own interest groups. If you selected this option then the name of your group would appear on the subscribe form. In this case we don’t want it to appear. 5. Custom success page – allows you to send subscribers to your own customized thank you page on your website. 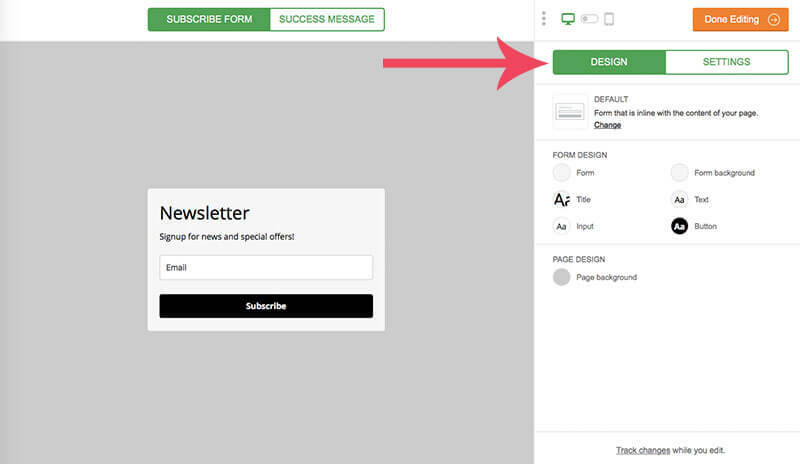 Step 4: Customize your confirmation email and confirmation page. When you use Mailerlite’s double opt in feature your subscriber will receive a confirmation email before they are added to your list to receive their opt in freebie. 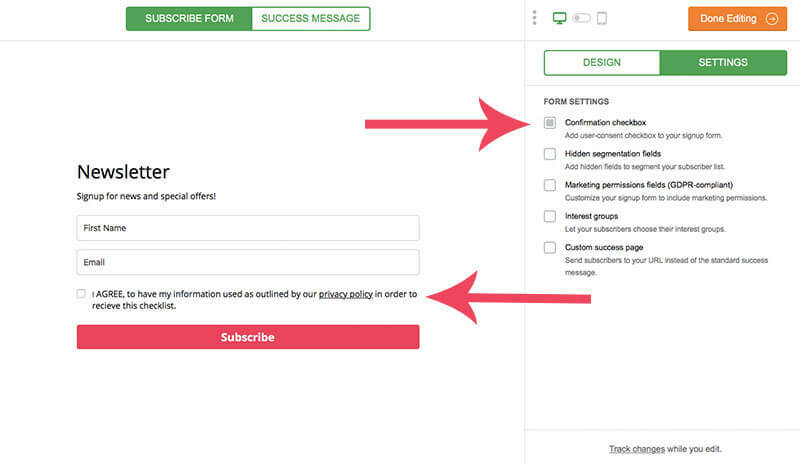 You do have the option to turn this feature off, but it is a good idea to keep it on because it limits the amount of spam emails you get signed up to your list because the person has to go into their email to confirm their subscription. When you click on Confirmation Thank You Page and scroll to the bottom you can add a custom URL from your website. By using a custom URL you can create a goal in Google Analytics and track the number of visitors who complete the double opt in process vs. the number who land on your thank you page. 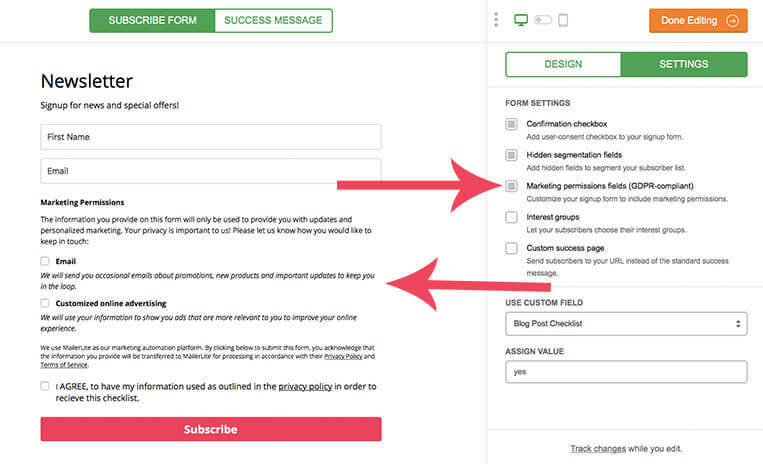 Before you add your opt in form on your website you want to make sure you have your automations set up. I recommend setting up two different automations. In the Mailerlite dashboard click on Automations and create a new workflow. Give your workflow a name and then select a trigger. Select the trigger: Updated field. Select your custom field for your opt in freebie is equal to yes. Next, click on the plus icon to add a new step. Here are all of the steps you should add (See diagram below). Add Email with link to your opt in. I save my freebie in dropbox and then include the link within the email. 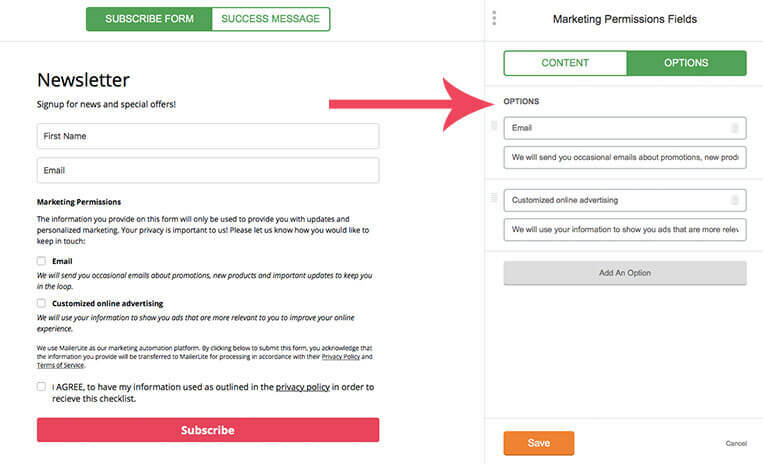 Set a Condition: In order to send your welcome email sequence the person should have selected the email field on your opt in form allowing you to send them promotional email. To define your condition create your condition based on a custom fields. From the drop down menu select marketing permissions contains Email (use the name you designated on your form for this field). Go through the same process as outlined above to create a new workflow. Generally you want to have your welcome sequence be a series of email with a delay in between. 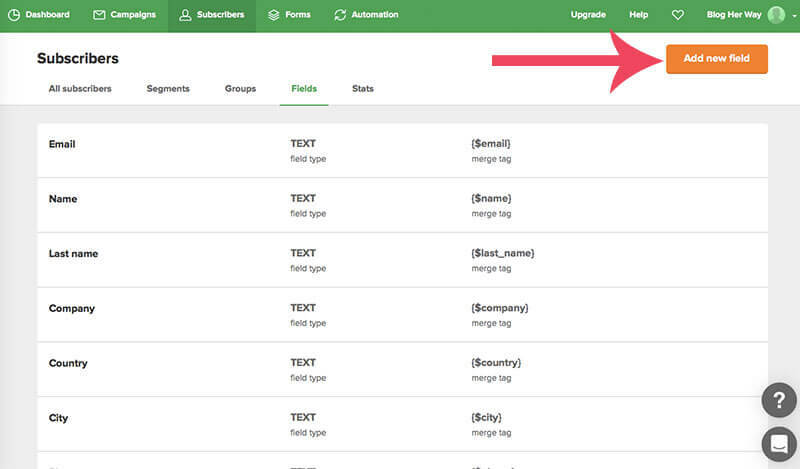 At the end of your sequence add an action to update custom field (welcome email) to completed. This way when you go to send out your regular promotional emails you will segment your list to only those who have completed the welcome email sequence. 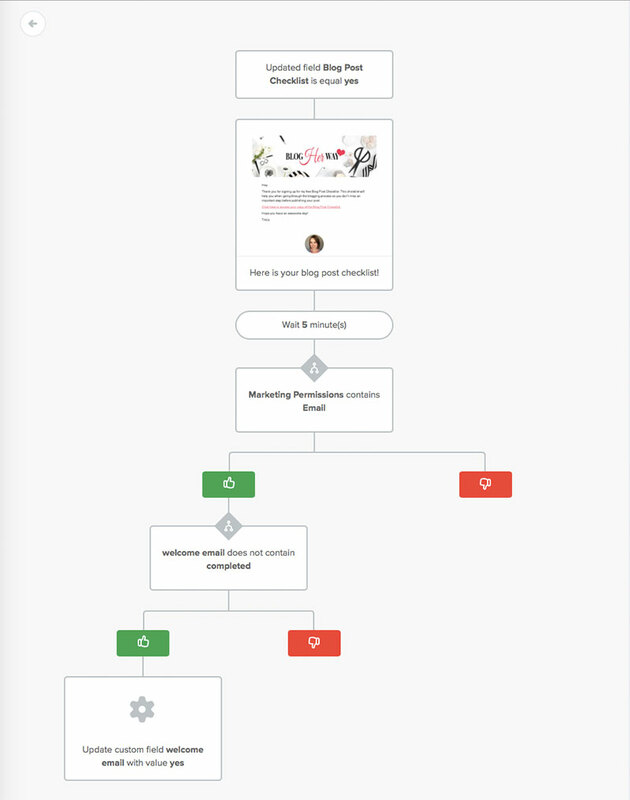 Here is an example workflow with just one email. 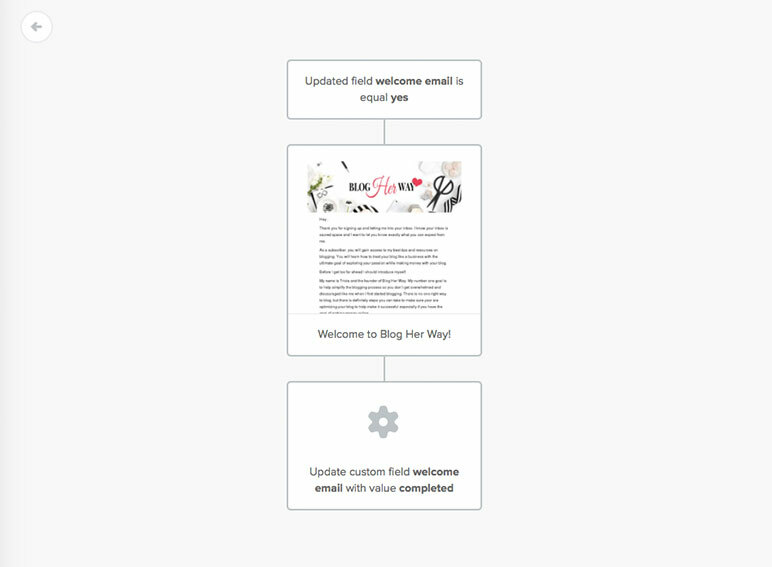 You only have to create one welcome email series automation and then for each opt in you have on your website you should create its own automation workflow as described above. 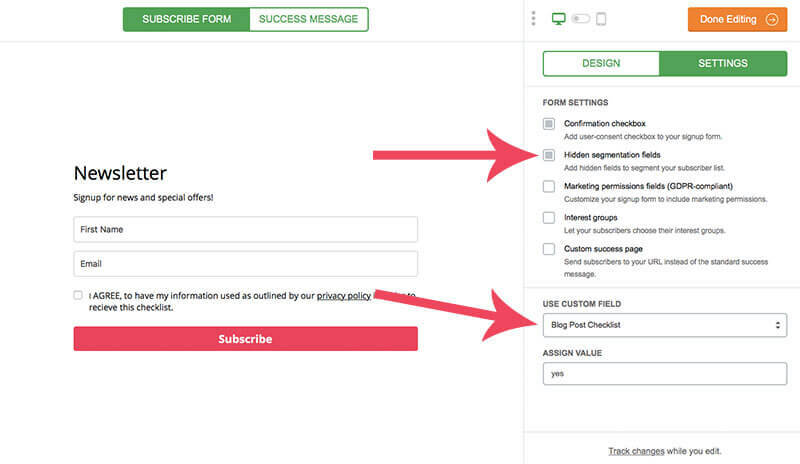 Under forms > Embedded forms click on the form you created. 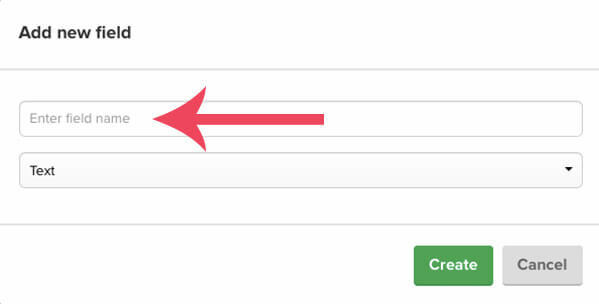 Under form settings scroll down to Embed form onto your website and select the HTML tab. Copy this code and paste it into your website using your text editor or html section with a page builder plugin. Don’t forget to test your forms to make sure everything is working. 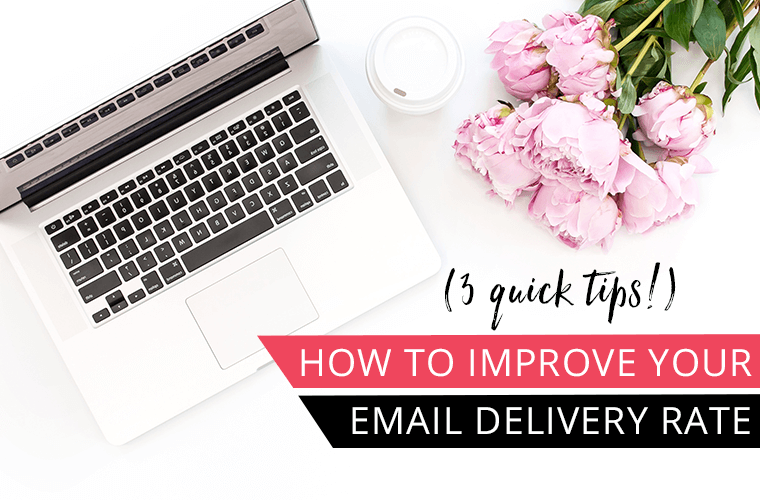 Make sure you test it with a new email address so you can see how it reacts as if you were a new subscriber. 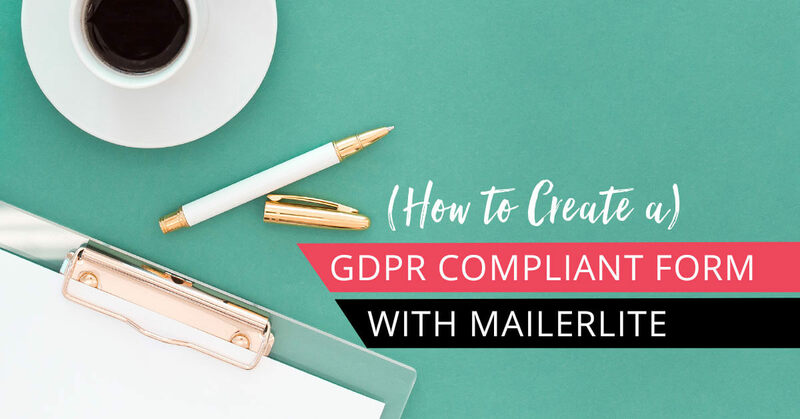 Make your blog GDPR compliant with Mailerlite’s new GDPR form features! GDPR is upon us whether you like it or not. If you collect or process any personal information from anyone within the EU then you need to be compliant. One of the first places to start is with your opt in forms. Read more about the other new features Mailerlite has to help you be GDPR compliant. If you are new to email marketing then Mailerlite has all the necessary features and they are free for the first 1,000 subscribers. 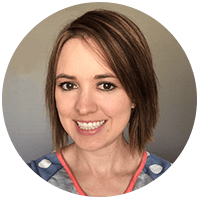 Emma thanks for the question, are you trying to modify an already existing automation? In order to use Mailerlite’s new features you have to create a brand new automation. Hope that solves it. If you still don’t see it then I would open the chat box and send them a message. Recently my automations were not working and they said there was a technical issue behind the scenes they had to fix.